Hi there! First time poster here. 8 months ago I found a deer head in the woods. At the time it was less than 24 hours dead. So I put it in a tub and buried it in the woods. Dug it back up a few days ago. The tub had filled with water at some point and the skull was clean (ish) but stained brown. So I threw it on my back porch in a container of dish soap and h2o2. But the color is still the same. I’ve been replaced the peroxide occasionally and trying to clean off some bits of remaining flesh. I’m considering putting it in a stock pot and simmering it with the peroxide to really whiten it. Downside is that I have no access to an outdoor heating element so doing it inside could get gross fast. Any advice? Also picked up a doe skull yesterday on a hike. It also still has flesh attached to it. Should it get simmered? Note: I live in an apartment. So I can’t hang up skulls outside, use a hose, or heat them outside as I have no outdoor property outside my porch. You can use towels soaked in hydrogen peroxide and wrapped in plastic set in the sun. 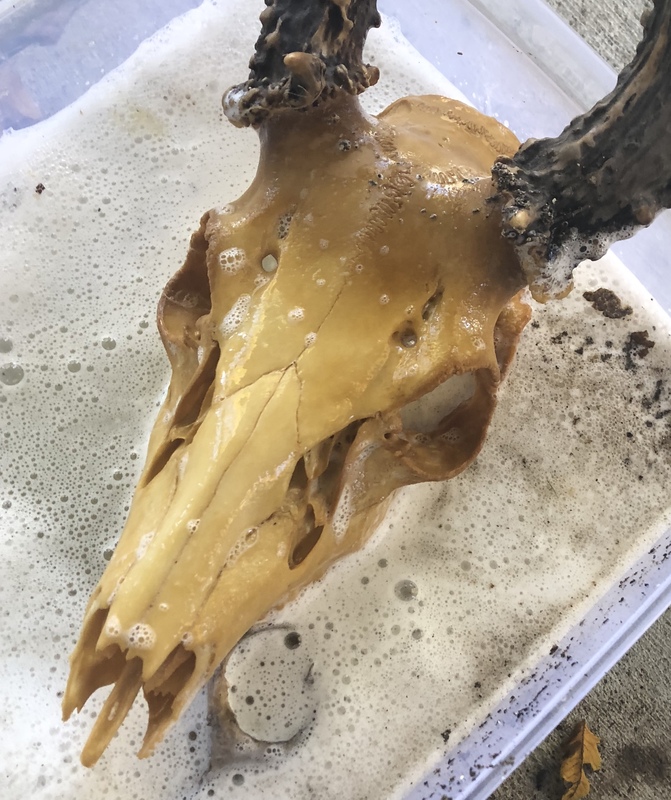 This article shows the method being used on an old cow skull. For whitening, I don't think that you need any dish soap or extra water. You should boil the other skull to help get the bits off. Related: How to clean bones found outside? The over the counter H202 isn't going to do the job with a skull that discoloured. You need to get some stonger stuff. Over the counter hydrogen peroxide is diluted, it's only about 3% pure. Taxidermists use 40 volume hydrogen peroxide, it's far stronger than the drug store stuff, and will produce the results you want. There are also other products you can use in conjunction with the 40 volume that will turn your skull bleach white. Not the answer you're looking for? Browse other questions tagged hunting or ask your own question. How to clean bones found outside? Why are there separate seasons for archery and firearm hunting for deer? What are the pros and cons of introducing new safety colors for hunting?